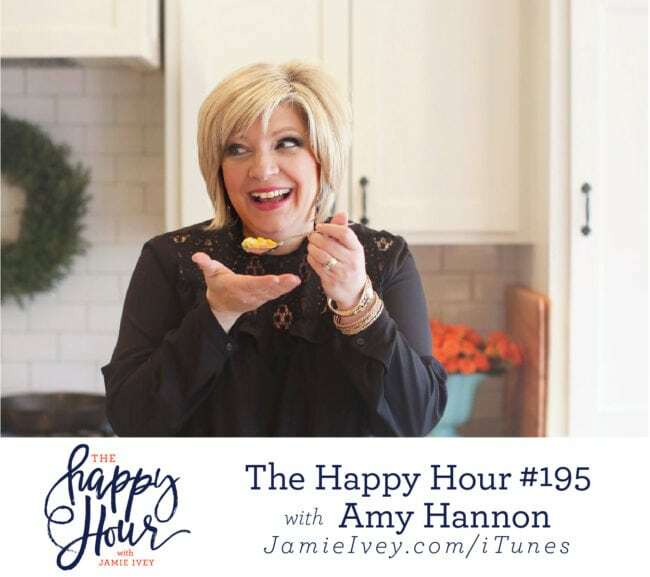 My guest for The Happy Hour # 195 is Amy Hannon. Amy is the owner of Euna Mae’s, a kitchen boutique that is not only is a special place to locals, but has also become a destination shop for many around the country. You can also find Amy on her cooking show on Northwest Arkansas’ NBC affiliate, a food blog, and her recently published “Love Welcome Serve” cookbook. I know many of you are familiar with Amy’s super cute shop Euna Mae’s – and don’t worry if you thought her name was Euna Mae (she gets that a lot)! Amy and I begin today’s show talking about the bittersweet emotions that come when your kids begin to leave the nest. Amy is momma to three and she shares about her youngest graduating just this past weekend! We then talk about what hospitality means to her. Amy has never met a stranger and and that “hospitality is making people feel like they matter” – I love the way she describes that. Amy and I also discuss how in our culture we can get the meaning of hospitality wrong and shift the focus inward instead of serving others from the heart. Jamie, I love your Happy Hour Podcast. Since, I just discovered them this year, I have been listening to past podcast as well as listening to the new one every week. Your podcast makes me feel like I am in a room with some girlfriends just hanging out. Your podcast is the best part of my week. I was wondering if you have every thought of interviewing Tracie Hamilton? She is the beautiful mom and wife of gold medalists Scott Hamilton. Your family is very similar to the Hamilton family. Scott and Tracie also adopted a brother and sister from Haiti and they have two biological children of their own. They also have 3 boys and 1 girl. Their children are the same ages as your kids or are very close in age. As a nanny, I would babysit on occasion for them and I love the way they parent their children. The family as a whole has such an amazing outlook on life even after Scott’s cancer returned. I love how they always put God first in their lives. When it comes to Scott’s cancer and all the issues that come with adopting children from another country. I have heard you talk about dealing with your children’s trauma after they were adopted. Try dealing with all that trauma and a husband whose cancer has returned. Tracie has done all that and has never lost her Faith. I think Tracie would be a great one to get to know. I would be happy to put you in touch with her. She is one of my sheros! Hi I’ve been so encouraged by your podcast. Thank you! Wondering if there’s an email we can send podcast subject suggestions to? Don’t want to post publicly though. Thanks!